The Dow Jones index of major US shares closed at an all-time high for the second consecutive day, after Tuesday saw the highest close since 2000. The Dow leapt 123.27 points or 1.05% at 11,850.61, from 11,727.34 on Tuesday. Also for the second day the index saw a record intra-day high. The Standard & Poor's 500 also hit its highest level in more than five years. The rise was spurred by falling oil prices and signs that interest rates are likely to be left unchanged. The Dow's new intraday high rose to 11,851.25, having hit 11,758.95 on Tuesday. With the S&P up 8% for the year, and the Dow making new highs, "you have to remember the old Wall Street adage" said Mike Driscoll, a Bear Stearns trader. "The Dow industrials are the generals, and once the generals push through to the fore, then the troops play catch up." The Dow Jones new record came after lower-than-expected service sector growth for September, a sign of a cooling economy. With the slowing services sector - which represents about 80% US economic activity - and a slow down in the housing market, analysts think it increasingly likely that the Federal Reserve will opt to maintain interest rates at 5.25%. Oil prices fell below $58 a barrel - its lowest since mid February - before later climbing to $59.41. Economists think lower oil prices could encourage consumer spending and buoy corporate profits. However Federal Reserve head Ben Bernanke on Wednesday said inflation was still too high. But he also confirmed a slower housing market and said this would continue to impact economic growth. 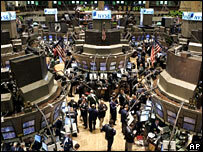 Until Tuesday the highest Dow Jones index close had been 11,722.98, which it set in January 2000. When the index hit that peak, the internet boom was in full swing. But the index later dropped to 7,286.27 in October 2002 before recovering.